But there's more coming up soon, so keep reading! Over the last three days we've been twice on the boat and for one dive on the beach, completing Instructor level Specialty training as Deep diving, Digital Underwater Photography (DUP), Multilevel, Boat diving, Under Water Navigation and Diving Propulsion Vehicle (DPV) or Under Water Scooter for Gideon, Simon, Marcus and Satoshi so they can become Master Scuba Diver Trainers or MSDT's. 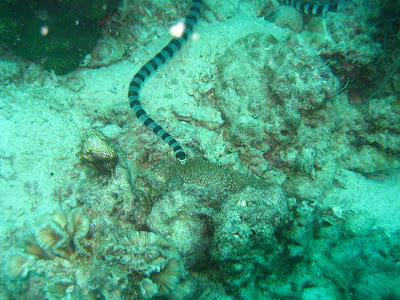 During the DUP dive we saw this sea snake. It was a while ago I saw one and it was nice to see one again. During this dove we also encountered a very bog solitary barracuda which was at least one meters and a whole school of squid. This is how one of the Diving Propulsion Vehicle (DPV) or Under Water Scooter's looks like. They're a lot of fun underwater and get you somewhere real fast! 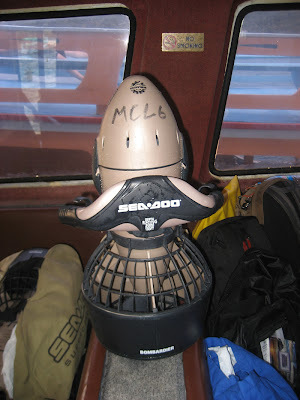 We'll be off to Pattaya for more Instructor Specialties this Sunday and Wreck diving is on the schedule amongst others. Stay tuned for our adventures in Pattaya.